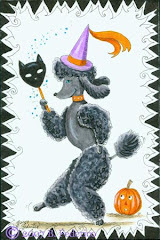 Witchy Poodle Artist: It's Here! My New Federico Fantasy Art Website! It's Here! My New Federico Fantasy Art Website! It's here! 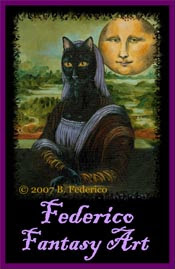 I have finally completed my new art web site, Federico Fantasy Art. 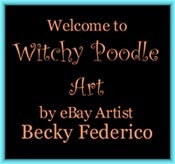 PayPal icons have been added so that collectors can purchase original art directly on my site instead of eBay. You will find several new pen & ink paintings of Black Cat Parody art featuring parodies of classic artists like Carriera, Botticelli, and Gericault, along with a fun hand painted Black Cat music box. I plan on adding an original painted Black Cat cigar box purse by the end of this week. Love your new artwork too! Wow! I love your art and your blog. 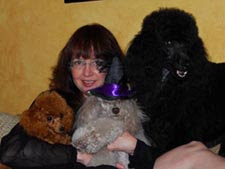 I somehow found myself on your blog this morning...you know how it is...from one link to another...into new worlds. Anyway...so happy to have found you!